My god, keeping your dog’s nails neat can be a total headache. After my best dog clippers post, I wondered what’s a common frustration all pet owners experience at some point. And sure enough, there it was: the nails. Even with the best dog nail grinders this can prove to be quite the challenging task. Pet nail clippers are an even worse feat to achieve, so scratch that for now. Honestly, when I saw the pet nail grinders some sites recommended, my head hurt. A product having lots of Amazon reviews doesn’t mean it’s the best for your fluffy one! I also didn’t see anybody mentioning that you can actually use the Dremel Minimite instead of the pet-branded Dremel model. 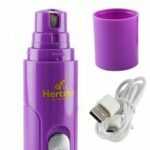 It’s more powerful, especially if you want a nail grinder for large dogs or a pet grinder for thick nails. So, what I’d like to achieve with this article is to provide you with objective reviews about the best dog nail grinders out there in the market. After the top picks, I’ll also give you some quick tips on grinding your pet’s nails with relevant videos. Large dogs & extra thick nails. Puppies, kittens, guinea pigs, birds and other small animals. Tougher diamond bit grinder needs no replacements. Small/medium dogs, thicker nail types will be hard. Stationary bushing covers the head to protect pets. Small/medium dogs/cats that are skittish or anxious. Extremely quiet and starkly reduced vibrations. Note: This is a powerful, fast-grinding device. Be careful with it. I’d recommend you use it with bigger dog breeds and harder nails. 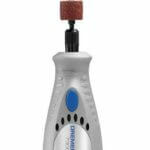 If it’s about tough to grind nails, there’s no better Dremel for dog nails than the Minimite. Its two speeds – at 6500 and 13000 rotations per minute, provide you with a real powerhouse. Unlike the pet-branded Dremel 7300-PT, it also comes with a wider range of accessories. This means you can use it for other household-related tasks too! At 8″, it can feel a bit bigger than other best dog nail grinders. However, no other model can match the performance of the Minimite. It should help you take care of even the most stubborn black nails that refuse to budge otherwise. It takes 3 hours to charge fully and should last you for a while. With the 8 accessories you’ll get with it, you have a full household helper in your hands. The downside is that it can be too powerful for puppies or smaller breeds. Also, make sure to read some of the instructions! A lot of people are complaining about the accessories not fitting: you just have to inspect the collet carefully. When it comes to your pet’s comfort, the Innopaw takes the cake. First of all, it has a stationary bushing that covers the grinding head. This greatly minimizes any risks of your pet getting harmed if it jerks when you trim the nails. Above all, though, the Innopaw is comfortable for you too with its ergonomic design. At only 5.3″, it’s tinier than the Dremel. However, its ABS-made case doesn’t compromise on durability and sturdiness. This professional dog nail grinder comes with 3 adjustable ports. You can choose one according to your dog’s size and nail type (how hard they are, how big etc.) You can also use it as a pretty good cat nail grinder too. Once again a cordless device, the Innopaw runs on 2 AA batteries. I have no complaints about the way it holds its charge. The bad news is that the grinding wheel is a bit fine. This means that grinding dogs’ nails can take a bit more time and it’s important to really use one of the best dog nail grinders out there. If you have a small/medium breed, it’s ok. For bigger dogs with thicker nails, I wouldn’t recommend getting the Innopaw. 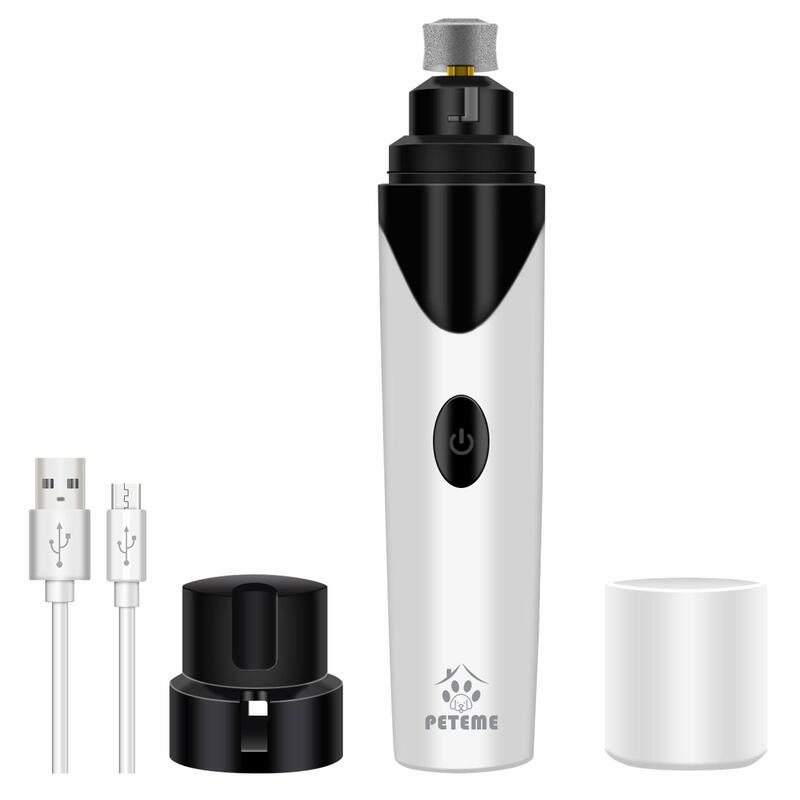 Peteme offers you a pet nail grinder that works on everything from dogs to cats, birds and even rabbits. 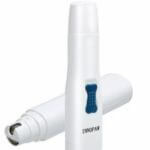 Once again it offers three grinding sizes: just pick the one that suits your pet the most. The big news with this nail grinder for pets is the use of a diamond bit grinder. Its sturdier, safer and long-lasting compared to standard types. On top of that, you don’t need any replacement parts due to its toughness! Furthermore, you can recharge it just with a USB – with the USB cable included in the purchase. Charging it for 2 hours will yield you 3 hours of operation, which is quite spectacular. Its silent mode of operation is also something praiseworthy. Very minimalistic in its design, it also scores high in terms of quiet operation. My only remark would once again be the fact that it isn’t the optimal choice if you have an enormous dog. It’s not only about Hertzko’s eye-catching, bold purple color. This professional nail grinder for dogs runs extremely quiet and reduces vibrations as much as possible. Skittish pets now have a new favorite! Same as Babadio, Hertzko relies on the better diamond bit grinder for optimal results. It’s also a bit better for larger dogs, but I still recommend you to grab it for smaller/medium breeds. With three openings of different size, this nail grinder for dogs can easily fit your pooch’s nail shape/size and paws. I’d recommend it as the best cat nail grinder too. I really have to praise how safe/calming Hertzo have made this tool. Even more sensitive pets should have no issues with this nail grinder. All said and done, this tool still lags behind the Dremel powerhouse. Not all people would like its flashy design too. If you’re into more mundane, polished looks, grab one of my other offers. So, why not stick to dog nail clippers if you want to take care of your pet’s nails? If you’ve had the same experience like me, some dogs just won’t let you clip their nails. You can’t blame the poor pooches. Probably we’ve been the same when our parents tried using a nail clipper on our own hands and feet. Here’s where pet nail grinders come into play. These useful tools reduce the stress nail clippers might cause. Instead of cutting, you can simply grind away – and your dog won’t mind it as much. Most best dog nail grinders use sand paper-like material. As I mentioned in my dog nail grinder reviews above, however, some of them use a diamond bit grinder. It’s sturdier and lets you finish your grooming session faster. Another benefit of professional dog nail grinders is the fact you can use them to smooth nail edges. I’m sure you’ve experienced this yourself when using nail clippers: imprecise cuts leave the nail sharp and ready to snag itself on any surface. During your clipping sessions, your dog will surely move around and get anxious. There’s a high chance you won’t get the most precise cuts with clippers for nails. With the best dog nail grinders you have more control over the process, so you can get it right on the very first try. If you’re looking for the unpleasant side of things: I can almost guarantee you it’ll smell. That’s right, grinding your dog’s nails will accumulate a mix of fine dust particles accompanied by a very specific and not-that-pleasant whiff. The solution is to either grind your dog’s nails in an open space, or at least do it in a room you can air out afterwards. Nobody said it’s going to be easy. However, if you take your time to warm up your dog a bit, using a pet nail grinder won’t be too much of a fuss. As with other pet-related stuff, you should introduce the unknown source of fascination and fear (in your dog’s mind.) It’s not a one time thing – you should definitely adopt a gradual approach. I’d recommend you also rely on the usual stimulus: dog treats. A bite or two placed near the dog nail grinder can work wonders. Try to foster a positive impression of the tool. After a few times, you can also turn it on to gauge your pet’s reaction. Don’t forget to accompany this by another treat, perhaps a bigger one. Here’s a good video on introduction. You should hold your pet in a comfortable position both for you and for them. When holding the paw, don’t be too firm. Rather, be gentle, without loosening your grip too much. Pick your desired length of the nail and then make sure you grind it until it’s smooth. Check the underside of the nail too. As I mentioned, you don’t want any snagging after that. This depends on you, of course, but you can sneak a few treats during the grinding process too. A treat per each nail would be excessive. However, a small prize per every 2 or 3 nails might work wonders! Here’s another help video on how to grind your dog’s nails using the best dog nail grinders, this time on the process itself! 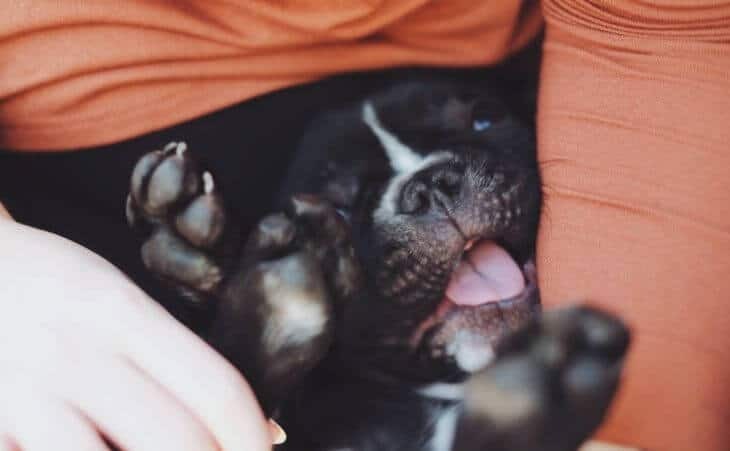 Best article about how to buy the best dog nail clippers and you have explained very well about how to clip the dog nails.